The owners of this property had been struggling with very poor drainage resulting in a garden which resembled a brown bog. 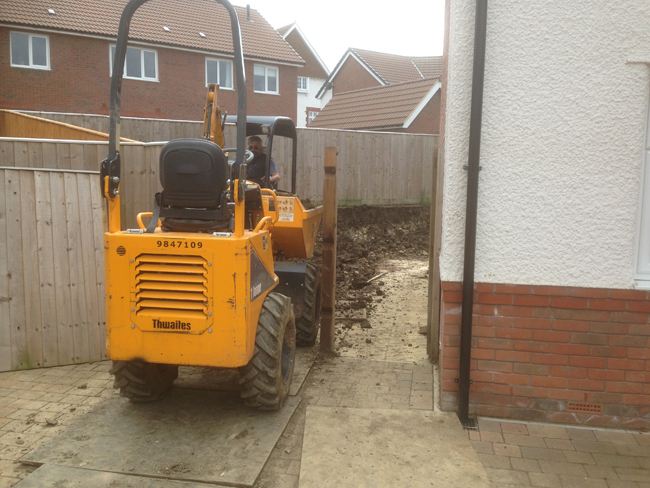 After several failed attempts by the house builders and further subcontractors to resolve the issues they turned to us here at Roots Landscaping to solve their problem and create them a beautiful lawned garden. 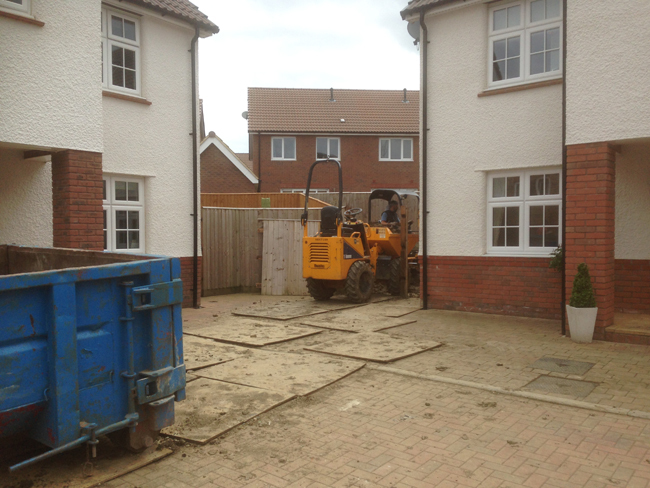 As with most new build estates of the last 30 years, the gardens are often the dumping ground of the excavations for the house. A mixture of clay, building waste and bad design, results, in most cases, as a sodden dying lawn infested with Crane fly larvae that eat away at the grass roots. The problem is garden drainage. 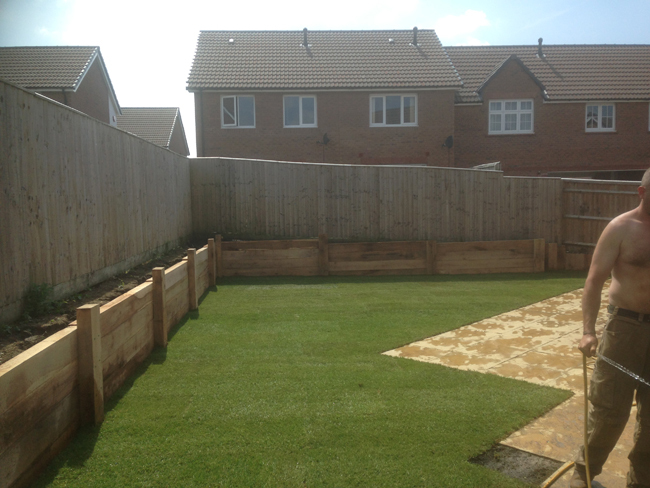 The clients at Cheswick village (near Filton) had tried various approaches recommended to them by various ‘experts’…..from infesting the ground with bug eating nematodes to removing the lawn and a foot of soil, and then replacing it with topsoil and new turf. Neither of these costly options worked because the problem was that the rainwater had nowhere to go. The garden just filled up like a swimming pool and the Crane fly larvae just moved back in again from next door! How we fixed this problematic garden. Here at Roots, we like a solution that works for the client on a permanent basis. We want to be recommended by our clients and we want to see them happy! 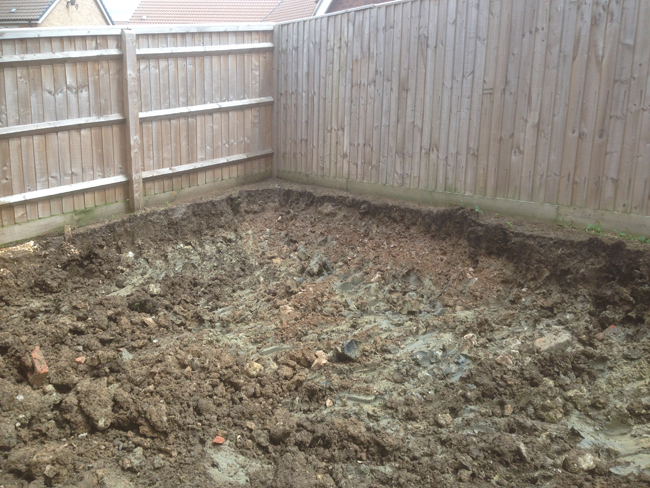 We advised the client to install a complete garden drainage solution with anti larvae features. We also agreed with the client that the current terracing of the garden made it unusable, and if we were going to bring in heavy plant equipment, then we may as well level the whole garden at the same time. This meant digging out over 100 cubic metres of clay and removing it cleanly from the site. We did this via 18 yard skips changed on a daily basis. Once removed, the garden borders had to be retained. Over seventy solid Oak sleepers were installed to provide the walls and these were back filled with gravel to prevent them from rotting and also to act as a barrier to invading larvae. We were now 200mm below the finished garden level. This depth allowed us to install a Land Drain piping system, coiled like a snake throughout the garden, with perforated sides to allow water to enter, and connected to the main sewage/rainwater system at the front of the property. Fortunately, as you can see from the photos, we had a lot of rain to test our system with. Great weather for Summer! We covered our piping system with permeable sheets and clean gravel, to prevent clogging, and then installed 15 tonnes of topsoil, mixing in 4 tonnes of clean limestone chippings to keep the pesky larvae at bay. 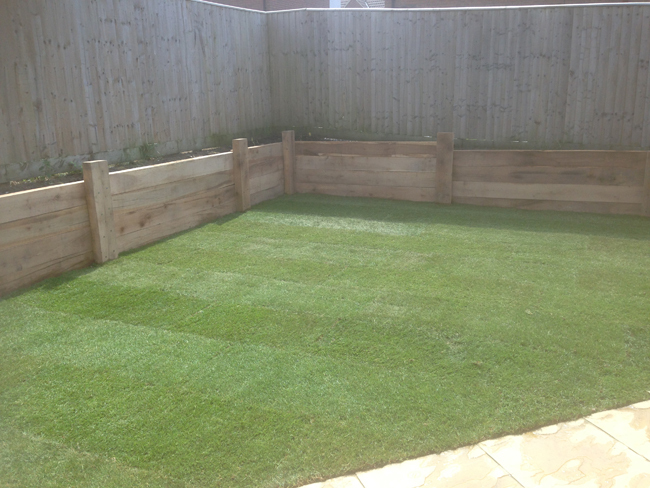 Finally we finished the job with a carpet of Rolawns finest turf…. The Queen uses it you know…! From initial contact to completion of the job we found John and his team to be extremely polite, hard working and diligent. From the outset, John was able to draw on his immense breadth of landscaping knowledge and offered several solutions and designs to meet our requirements and needs including several pricing options. During the work the team were courteous and diligent whilst digging out over 120 tonnes of clay and mud and battling through some atrocious weather. 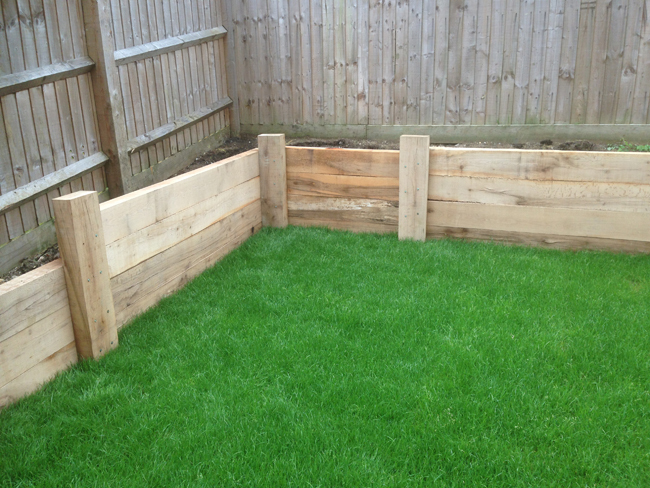 The end result has given us a charming and useful garden with a full drainage system and a great area for our children to use, which we did not have before. They have provided us a clever long term and durable solution which has stopped the return of the brown bog and allowed us to retain natural grass in area where the majority of our neighbours are turning to artificial. Do you have problems with your garden drainage?